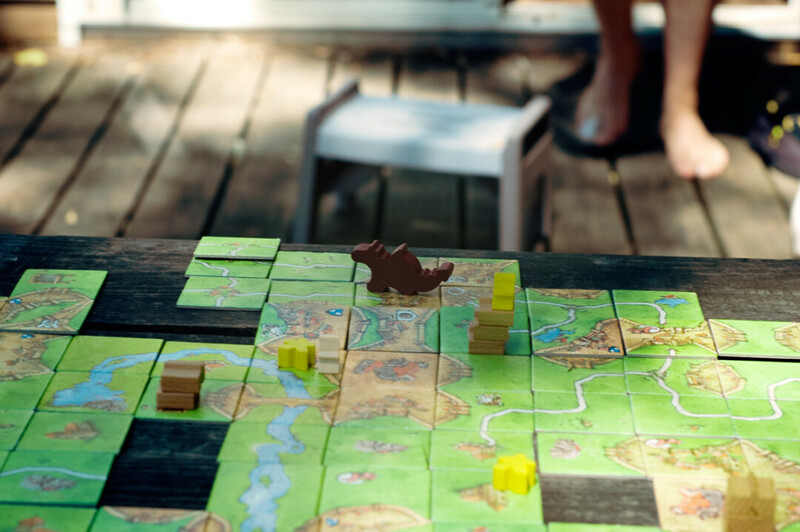 If you’re looking to ratchet up family game night (and explore the new breed of “Tabletop” board games roaring into popularity), try Carcassonne. Originally published in Germany and named after a medieval French city, Carcassonne offers the addictive “building” gameplay found in mega-hit Settlers of Catan but with simpler rules, allowing a quick learning curve for younger players (though the base game allows for added complexity if desired). The game board is a medieval landscape built by the players as the game progresses. It starts with a single “terrain” tile face up and 71 others shuffled face down for the players to draw from. On each turn a player draws a new terrain tile and places it adjacent to face-up tiles, matching up to and extending features like roads, fields, and cute little cities. As features are built up, players claim them by placing little wooden people on the board. The game ends when the last tile is placed. Players are then scored points according to the stuff they’ve claimed – more points for more stuff, and the bigger the stuff, the more it’s worth. My kids (5 and 8) picked up the basic rules immediately – it’s very tactile, with no cards to keep organized or complex strategies to contemplate – and they love the awesome illustrations on the sturdy terrain cards. At first my youngest needed a few gentle gameplay reminders, but he never needed a partner (as he does with more complicated games). Sometimes he gets a little antsy while playing, but play happens quickly, and a regular game only takes about a half hour or so. Proving Carcassonne’s versatility, my wife and I have played it with her parents (avid game lovers), adding in a few of the higher level rules, and we still had a satisfying blast. I believe it’s truly easy to learn and challenging for all ages.